In the 1930s, the only fox on the Outer Banks of North Carolina was the gray fox, and this is a photo of the Goosewing Club on a mounted hunt in an attempt to be subtropical English. Red foxes did not become fully established in most of the South until well into the twentieth century, so when you read accounts of fox chasing south of Virginia and Kentucky and outside the Appalachian Mountains from an earlier time period, they are almost certainly running hounds on gray fox. The gray fox is less suited for this type of pursuit because it doesn’t go to ground when pressed to hard. Its usual defense is to shoot up the nearest tree, and this behavior makes for a rather poor mounted hunt. The Eastern Canadian red fox is much better suited to this sort of thing. The red fox of the Eastern and Midwestern US is derived from that animal. It is not an import from England as was once commonly believed. The red fox came south after the clearing of the forests created better habitat for this more open land species. They were the first canids to expand their range dramatically after European contact and colonization. The coyote was the second. Gray foxes are the most divergent species of canid still in existence. Their exact lineage split off from the rest of the dogs some 8-12 million years ago, and they are the only species of dog still in existence that has a fully North American evolutionary history. Everything else, including the coyote, has derived from Eurasian ancestors that came back into the continent. They are truly America’s most special dog, one that really doesn’t get much attention, but the history of foxhunting in what became this country was largely based upon this animal in the early years. If I were to choose my own animal totem, it would be a gray fox. It lurks in the deep thickets on far distant ridges. It lives in defiance of our world, unsullied and unfettered by our desires. A wild dog that is truly out on its own journey, one that began millions of years ago in the ages before their were truly things called wolves or modern humans. Remote and distant goes the gray fox. The native red fox was always uncommon in West Virginia. Virtually all red foxes found in the state today are descended from British imports. This is the story of two foxes that live in one small state in the eastern part of the US. It is also the story of a place, its people, its changing economics, and its changing environment. The rise and fall of these two foxes is intimately tied to the story of this place and how the humans have shaped it. Without the human element to this story, things would be very different. The two foxes in this story appear to be quite similar. They are roughly the same size. They hunt almost the same prey and must worry about the same set of predators. They look very similar to each other, but as we shall see, these similarities are nothing more than the results of convergent evolution. The first fox in our story is the believed to be one of the most primitive of all wild dogs. It evolved in North America, and in this part of North America, it was totally at home in the vast deciduous forests that covered the hills and mountains. It lived here through the ice ages, hunting small game and avoiding the various large carnivores that harried its daily existence. 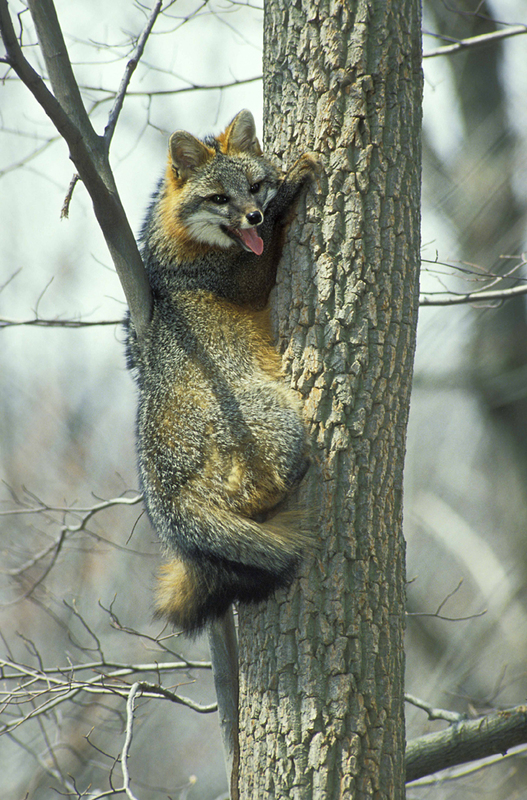 As the deciduous forests grew to cover the hillsides, the gray fox evolved as the perfect woodland creature. Gray fox in a tree. Unlike other wild dogs, it retained the primitive trait of tree climbing. Its powerful hooked claws allowed it to access the nests of birds and squirrels in the tallest trees, and although one might be hesitant to call them arboreal animals, they are the only wild dogs in these parts that are at home in the canopy, leaping from branch to branch. Such abilities also allowed them to escape predators, such as wolves and possibly the indigenous eastern coyote population that may have existed here before European settlement. Remains of Pleistocene coyotes have been found in West Virginia, and it is likely that these eastern coyotes were a major concern for these gray foxes. 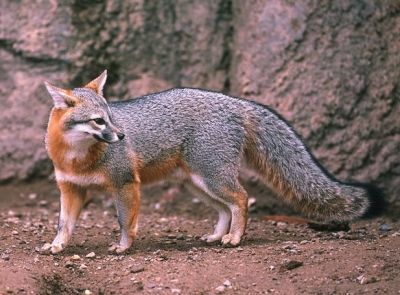 Indigenous peoples often kept gray foxes as pets. It is believed that the reason why the closely related island fox was able to colonize most of the Channel Islands is because the Native Americans of those islands kept them as pets, and they introduced them to the islands without foxes. Before European settlement, the second fox in our story is only a minor character. The native red fox was very scarce south of the 40th parallel of longitude in the eastern of North America. The red fox had entered North America via the Bering Land Bridge. The ancestral Asian red fox that colonized North America was supremely adapted to living in the colder parts of its native continent. When it entered North America, it remained a creature of the higher latitudes and higher altitudes. Because of its more northerly distribution, the native red fox evolved a bit larger than the gray. Its greater size was accentuated by its more profuse coat. Before Europeans settled this part of the continent, it would be a truly rare event for a red fox to be seen in West Virginia. This fox was simply more at home in the boreal forest and the so-called mixed forest that is the transition between the northern forest and the oak-hickory woods. Before European settlement, West Virginia was the domain of the gray fox. But all of this was to change. In 1607, a join-stock company headquartered in London sent a band of explorers to search for gold on the southern shore of Chesapeake Bay. They were to set up a settlement in the America for the English Crown. Settling on the broad estuary of the James River, these explorers found no gold, and their settlement nearly went belly-up due to all sort of misfortune, some of which was caused by their own laziness. When it was discovered that the coastal plain along Chesapeake Bay was the perfect place to raise tobacco, the colony was saved. Tobacco was grown everywhere. Scores of people wanted to move there. A man could arrive a common thief or poacher and within a few years’ time, could become wealthy beyond his wildest dreams. The private company that controlled the colony even persuaded the parliament to pass a law that banned the growing of tobacco in England, just so that the colony could continue to monopolize the crop. Jamestown, as the original settlement was known, soon became part of a growing colony called Virginia. One settlement grew into eight shires– all of which were devoted to the growing of tobacco. In 1629, another colony was founded on the northern part of Chesapeake Bay. Cecil Calvert, 1st Lord Baltimore, was given a royal charter for this land, which he intended to turn into a profitable tobacco colony. The first settlers came in 1634, but unlike Virginia it would be set aside for English Roman Catholics. Both Maryland and Virginia rewarded colonists with land grants by the number of laborers they could import to the colonies (it was called the “headright” system). Some of the best ways to get colonists to get these land grants was to go to the local jail and round up as many poachers, thieves, and cattle rustlers one could find. Take them as indentured labor. Let them work for seven years on a plantation. Set the free. They get land, and they get rich growing tobacco. Both of these colonies were successes. Great fortunes were made by people who had started out relatively poor. Some of the wealthiest planters had arrived as indentured laborers, who had been taken out of some English jail or prison. Stories of success were widely circulated in England. In the seventeenth century, England was a mess. The Enclosure that had begun under Henry VII began to accelerate. The manors were being fenced off, and large numbers of common people were rushing to the cities. To make matters worse, grain prices were often quite high, and many people were starving. Many people were forced into criminal activity just to survive. The lucky few who got transported and survived both the transport and seven years of indenture and who then got land on which to grow their own tobacco fortunes certainly were better off than the great multitude of English citizens. Virginia came to mean a chance to rise well beyond one’s station. A chance not to starve. A chance to own your own land. And your own destiny. Then, the English Civil War came. Virginia, in particular, supported Charles I and the Royalists, whose warriors called themselves Cavaliers. When Charles I was overthrown, tried for treason, and then beheaded, large numbers of royalists came to Virginia and Maryland. The migration of large numbers of Royalists to the Chesapeake Bay would leave an indelible mark upon the culture of the region. After all, the University of Virginia’s mascot is the Cavalier, and Confederate General “Jeb” Stuart imagined himself a descendant of Charles I’s Stuart Dynasty and that he himself was a nineteenth cavalier fighting the Yankees, who were originally descendants of East Anglian Puritans, who originally did support the Parliamentarians in the English Civil War. The migration of Royalists to Chesapeake Bay also changed the landscape. The Royalists had mostly been supportive of customs and politics of the big landholders in England. When they came to Virginia and Maryland, they did the same. They had a sense of what English aristocrats should do, so they tried their best to Anglicize the entire Tidewater region. 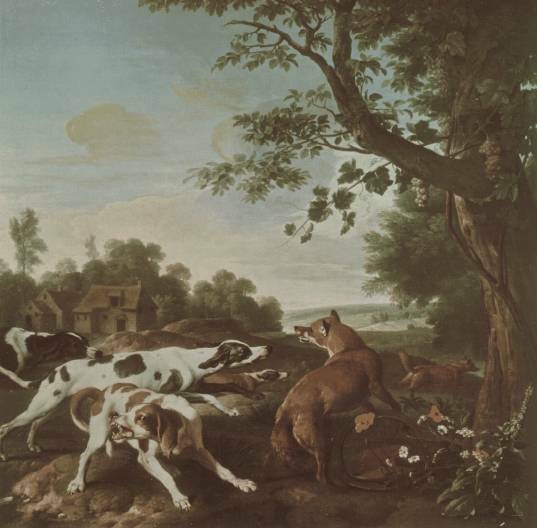 One of the most important ways of Anglicizing this region was to introduce hunting with hounds. Landed gentry in Maryland and Virginia were very quick to adopt this custom, but there was a problem. The most important kind of hunt one could have in England was the mounted fox hunt. The big fad among English landholders was to have mounted fox hunts. We tend to think of these fox hunts as part of English tradition. In the seventeenth century, they were just becoming popular. They were the fad among the English nobility. And to make matters worse, as the land was cleared to make more agricultural land, the gray fox was less common. And if hounds hunted the gray fox, the chase was always short. Gray foxes simply can end the whole game with a simple dart up the nearest tree. Most English foxhounds were unaccustomed to treeing and had not been selected for this behavior, and without red foxes to chase, the tradition could not be imported. So they imported red foxes. European red foxes are different from native red foxes in several ways. Those that lived in England had evolved to live in agricultural land. The primeval forest that once covered most of England had been felled ages ago to make way for the production of grain. 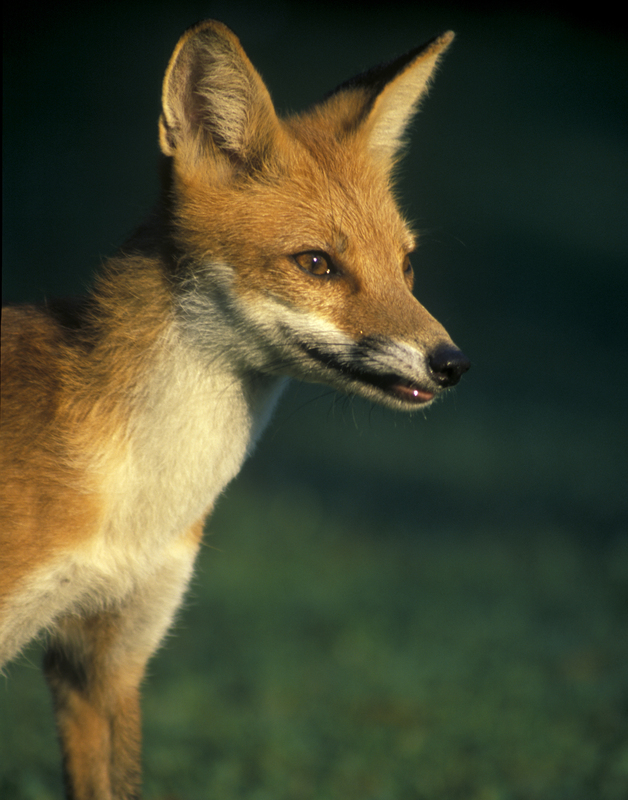 Furthermore, English red foxes had evolved with hounds nipping at their heels. Foxes were considered a beast of chase in Medieval England, and by the sixteenth century, fox hunting had become a favorite past time of the landed gentry. As the manors enclosed, vast spaces of the English countryside were open for mounted fox hunts. However, as was noted earlier, the true mounted fox hunts as we know them today essentially evolved at roughly the same time as the first fox hound packs were being imported the Chesapeake Bay region. The European red foxes did fairly well in the open agricultural lands of Maryland and Virginia. They soon multiplied, and by the eighteenth century were found throughout the region. Across the Blue Ridge in what became West Virginia, the world was still safe for the gray fox. The woods remained thick and deep, and the tree climbing fox was still thriving. In the middle of the eighteenth century, settlers from Pennsylvania began to travel south along what was called the Pennsylvania and New York had been settled by a diverse group of settlers. In addition to the ruling Quakers in Pennsylvania and the Dutch patroons of New York, there were large numbers of German and Scots-Irish colonists. The Germans had left the warring factions of Central Europe behind in search of new land to farm. Almost all of them were simple farmers. Some of them belonged to religious minority groups, while others were nothing more than German yeoman farmers who were tired of going to war every two or three years. The Scots-Irish were protestants from Northern Ireland, who had been planted by James I. He wanted to have some control over the border between England and Scotland. He was monarch over both, and the nobles on both sides of the border were picking fights with each other. There were also raids by people called the Border Reivers who were able to live outside the law in both countries. Moving these people to Ireland was a smart move, because then one could kill two birds with one stone. The people who were causing this trouble on the border were now in Ireland, and one could begin the process of protestantizing Ireland, which, in theory, would make Ireland easier to rule. Other protestants besides Scottish Borderers and Northumberland reivers were brought over to Ireland for this purpose, including German and French protestants. However, we tend to call all protestants who came to America from Ulster Scots-Irish. Of course, the Ireland never became protestant through those plantations, and the native Irish Catholics didn’t much like these protestants. So by the early eighteenth century, great waves of protestants from Ulster came to America. They settled everywhere, but their main ports of entry were New York and Philadelphia. Both Germans and Scots-Irish settlers took the route out of Pennsylvania into Central Maryland and the Shenandoah Vally of Virginia. Those who managed to settle in the Shenandoah Valley found themselves in very good farm country. They cleared the land, and the European red foxes moved in. Those who settled west of the Shenandoah Valley still found good farmland in the Ridge and Valley Province that lies between the Blue Ridge and the Allegheny Front. The broad valleys were quite fertile, and as they cleared the land, the gray fox lost some ground. And the European red gained some. But beyond the Allegheny Front, the little gray fox was still living as it always did. Virginia now had two European-based cultures living on it. What became known as the Tuckahoe culture was that of the landed and usually slave-holding gentry of the Tidewater, which was based largely on the Royalist culture that came to the region following the English Civil War. And beyond the Blue Ridge, the Scots-Irish and German “Cohee” culture, which was based upon what we would now call the frontier ethic. Every man for himself. Trust no established authority. Live and let live. Germans and Scots Irish had a very good reason to be distrustful of authority. Their own lives had been made that much harder by the arbitrary caprices of an authoritarian government. It is in this ethic that American individualism was born. Despite their differences, the results on the land were the same. Forests were cleared. Grain was planted. The European red fox was at home in this new agricultural land. It became the dominant fox in these areas. When settlers came across the Alleghenies in the middle and later parts of the eighteenth century, the land was cleared for farming. The top soil is very thin, and farming was always a challenge. I don’t know why people settled here to become subsistence farmers. But they did. I think many of them wanted to settle in a place more like the area around Columbus, Ohio, but in the eighteenth century, that part of the world was still the domain of various Native American groups and not open for settlement. So they settled for the inferior land, hoping that the land just to the west would one day open up. But to live in what became Trans-Allegheny Virginia, they had to clear a lot of land. And as the land cleared, the gray fox lost its dominance. In the Allegheny Front, it was able to hold on a little longer, but in the lowlands to the West, the European red fox took over. The first settlers to this part of the world brought only functional dogs– dogs we would now call feists, curs, and shepherds. A dog had to be able to hunt game, guard against hostile intruders, and control livestock. A few people did have hounds, but these hounds also had to be multipurpose. The thoroughbred foxhounds of the Tuckahoes in the Tidewater were simply out of the question. Foxes were hunted as vermin, as they originally were in England. Foxes were originally hunted at night and killed. There was no ceremony to it. When the Civil War came, the original divisions between Tuckahoe and Cohee led to the splitting of Virginia. The Cohee culture in the west largely supported the North, or rather, it figured out that the Yankees were going to win and wanted to use this war as an excuse to get back at the Tuckahoes. Tuckahoes were not much into developing Trans-Allegheny Virginia. The land was very poor for tobacco plantations, and they couldn’t really farm it as was done in the Shenandoah Valley. So they did very little. This bred a lot of resentment in Viginia itself, which spilled over into the Civil War. After the war, the new state of West Virginia began to industrialize. The big forests in the higher and more remote areas of the state were felled. Coal mines were open. Oil and natural gas wells were drilled. The small farmer may not have received much for allowing the royalties on his land to go to the big timber, coal, and oil and gas concerns. But some farmers did develop some disposable income. They still worked the land, but they now had time to work on different pursuits besides farming and keeping the varmints down. The average farmer could now afford to own foxhounds, and in the late nineteenth and early twentieth centuries, virtually all small farmers had at least of brace of hounds. The gray fox was not common at all in those days. Every hillside was a pasture. Every river bottom was a cornfield. European red foxes were doing pretty well. Because every farmer owned a foxhound or two, a distinct fox hunting culture evolved. Often, a couple of farmers would get together on some cool October evening. Each would bring a brace or two of foxhounds. They would set a bonfire and release the hounds. Whiskey or some other fermented beverage would make an appearance as the men sat stood around the fire, listening to the hounds chase the fox. At other times, different civic groups would put together big hunts in which all the men from surrounding areas would bring their best hounds. These hunts could attract as many as 50 to 100 different hounds, which were then all released onto the countryside. These were big events– major social gatherings. The fox had a very important place in Appalachian culture, but not as a true game animal. No one really wanted to kill a fox. They just wanted to see how long and how hard a dog could run them. A dog that could run long and hard was worth a lot. If a dog could run long and hard and keep up a steady bay on the trail, it was even better. This was not fox hunting. This is what we shall forever call fox chasing. The object is the chase, not the killing. There is another reason why no one would have wanted a red fox killed. Although European red foxes did very well in open agricultural lands in the US, they are always prone to mange. Mange is a significant control on red fox numbers. Even if the habitat is right, most parts of the US cannot have the high densities of red foxes that certain parts of southern England have. So killing foxes just wasn’t considered. I understood fox hunting from this perspective. Both of my grandpas fox chased. One still does. The other used to keep foxhounds that basically ran free in the woods. They chased foxes whenever they felt like it, and the local foxes almost reveled in giving them a good run. And the foxes ended it by running to ground. And if the red fox vixen and her mate had kits, they would thrash a whole pack of foxhound if the hound ran too near their den. Most of his foxhounds weren’t really prepared for a dog fox and vixen standing their ground to protect their young. Of course, this fox hunting culture is nearly gone. Farmers once used every hillside to pasture their cows. They used all the arable land they had to grow crops and silage. Every stand of oak had a few pigs pastured under it. Acorn pannage was known for making the pork particularly tasty. But after the Second World War, another wave of industrialization hit the United States. In cities like Cleveland and Detroit, industrial workers could make far more than anyone in West Virginia. The coal mines were more mechanized and needed fewer workers, and the chance of a better life as an auto or steelworker meant that a whole generation of West Virginians moved away. The exodus from Appalachia began. Those who remained continued to work the land, but farm subsidies in the Midwest and the new Interstate Highway system meant that food prices were going to be low. It was cheaper and far less labor intensive for someone in West Virginia to go to the grocery store and buy food than grow it on some rocky, hilly farm. The arable land went unploughed. The pastures were left grow. And within a few decades, the forest returned. The European red fox has lost some of its dominance here, for the gray fox is much better able to utilize a densely forested habitat. The grays are also openly hostile to the reds. In the days when fox pelts were worth a lot, the hunters would call them in using cassette recordings of fox vocalization. Because red fox pelts were worth more than those of grays, they were always using red fox calls. Both species could be called in on red vocalizations. Grey vocalizations would scare all the red foxes in an area away. So now not only is the land far more amenable to gray foxes, the gray foxes are using this advantage to drive out the few remaining reds. In the past few hundred years, the landscape has changed. The red fox is dominant throughout the country. Indeed, it is currently the most widespread of all wild dog species. But in West Virginia, the tide has switched back in the gray fox’s favor. Rural West Virginia may have declined as place for people, but in that decline has come a blessing for the gray fox. So long as its no longer useful to farm these steep and rocky hills, the forest will remain. And the gray fox will be at home here. If humans had never altered the landscape or introduced the European red fox to the Chesapeake Bay Tidewater, the gray fox would dominate this part of North America. Red foxes would be known only as creatures of the north and west. But today, both species are doing fairly well in West Virginia. However, the gray fox is now more numerous. They are creatures of the woodlands, and West Virginia is heavily. The story of these two foxes tells us how important habitat is in determining which species exist in a given area. Red foxes prefer more open land and are better equipped to live in most of the US. Their range has only increased since European settlement. The same cannot be said for the gray fox, but in some areas, like West Virginia, it is able to gain the upper hand. It’s gaining the upper hand where people aren’t. Watch the Labrador’s reaction to the calls.